Like Happy Jackson? Click here to view the entire range. 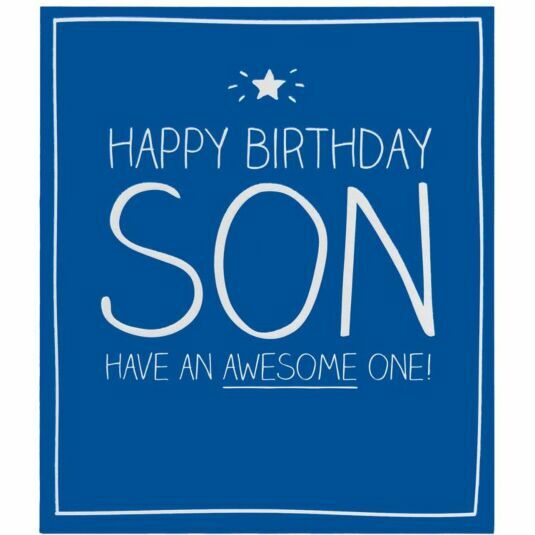 Why not wish your son a happy birthday with this lovely card from Happy Jackson. Suitable for a range of occasions, Happy Jackson bring you a range of fun, colourful and cleverly worded cards sure to make you, and the recipient of the delightful card smile. The card is blank on the inside ready for you to write your own message and comes with a white envelope. Standard delivery within the UK is charged at a rate of £3.99. Guaranteed, signed-for Courier delivery is available for just £6.99. *PLEASE NOTE: Certain items are excluded from our Free UK Delivery offer. These items are clearly indicated within their product description and within the checkout process. Many Personalised gifts are excluded from our Free UK Delivery offer and any limited time delivery offers as they are packaged and dispatched from a separate location. Personalised items may take longer than our standard delivery times, and Premium or Courier delivery may not be available. This information will be clearly indicated on the affected items. Orders containing only Carrie Elspeth jewellery qualify for optional 75p UK Delivery. These orders are sent using our Standard UK Delivery method. Please allow up to 5 days for delivery. Orders containing only greeting cards qualify for optional 75p UK Delivery. These orders are sent using our Standard UK Delivery method. Please allow up to 5 days for delivery. For international delivery, shipping price varies with spend. Fast, signed-for courier delivery by FedEx is also available to all international destinations. European delivery is split into two regions - European Union and Rest of Europe. Please see below for full details of country categorisation. Extremely rarely, in the event of unusually heavy or oversized orders going to overseas destinations, these shipping tariffs will prove insufficient to cover our costs. In which case we will contact you and request that you pay a postage surcharge to equal our specific shipping costs for your order. Should you choose not to pay that surcharge we will refund your payment in full and cancel your order. Should we receive no reply to this request we will hold your order for seven days and then refund your payment in full and cancel your order. If you would like to return an unwanted or damaged item back to us please inform our customer service team at customerservice@temptationgifts.com or 01494 790424 within 14 days of receiving the goods. You will be asked to send the item back to us at the address below. If the product has been damaged or received incorrectly you can give our customer service a call or email us to request a prepaid returns label to use. If however you have decided to return an item as it is unwanted please send this back to us at your expense, keeping a proof of postage. Please ensure they are returned in perfect condition and packaged securely, because you will only be eligible for a refund once we have received the goods and confirmed they are in a re-saleable condition. All returns are processed within five working days of them being received and we will send you an email when we have processed your return and inform you of any refunds that have been processed. Please allow 1-5 working days for refunds to be processed back into your account. Due to the personalised nature of these items, we are only able to accept returns or offer refunds if items are damaged or faulty. Temptation Gifts is a family-run business, trading since 1983 (online since 2000), serving over half a million customers last year alone. As a five-time winner of the prestigious award “Best UK Online Retailer”, we are passionate about creating a shopping experience that is fun, easy and hassle-free. All our products are hand-picked by our award-winning team of expert buyers who between them have more than 100 years’ experience of sourcing and selecting fantastic, on-trend gifts from the best brands and suppliers not just in the UK but worldwide. We know that you like to receive your goods as quickly as possible, so we always aim to despatch orders from our UK warehouse within 24 hours of receiving them. Each order is carefully and securely wrapped to make sure your purchase arrives without damage. If you need your order especially quickly, we also offer a Next Day UK delivery option. Turn your purchase into a gift with our gift-wrapping service! All you need to do is tick "Gift Wrap" before adding a product to your cart and leave the rest to us! Our team is on hand to wrap any of your presents beautifully, whatever the occasion. If you have any problems with your order, or simply want to inquire about a product before purchasing, simply give us a call or drop us an email. Our friendly Customer Service team will be happy to help with your queries. We pride ourselves on our "Excellent" five-star customer feedback, easily verifiable through over 7000 reviews! We have several fast, safe and secure ways for you to pay for your gifts. You can use a debit or credit card, PayPal or Amazon Payments, and always be certain that your transaction is completely secure. Happy Jackson was born in some of the most humble of beginnings imaginable. Creator Giles Andreae (Britain's best selling poet) sent his long-time collaborator Heather Flynn (a former Art Director at Hallmark Cards) a simple sketch of a pug dog. Whilst it may not have been quite the finished article, it had bags of character and fun. They both saw the beginnings of something larger starting to take shape. This simple little pug inspired the style and feel of their new brand, characterised by bold colour choices, playful design and, naturally, Giles' curt and witty words and phrases to further bring it all to life. And so we have Happy Jackson. Something that brings its own distinctive and playful swagger to the table. Happy Jackson is youthful, design-led, and perhaps most importantly, doesn't take itself too seriously. So whether it's a silly greeting card, a funny cake tin or a colourful notebook, we're certain this exciting range will put a smile on your face and a spring in your step. We're super proud and super happy that Happy Jackson have named TemptationGifts as their recommended online retailer, meaning you're in the best hands possible!